FORT HOOD, Texas – Thousands in the sprawling Central Texas post paused for a solemn memorial held for nine fallen warriors June 16 during a service inside the Spirit of Fort Hood Chapel here. Eight Soldiers from 3rd Battalion, 16th Field Artillery Regiment, 2nd Brigade Combat Team, 1st Cavalry Division, and one Cadet from the United States Military Academy at West Point, New York, were the victims of flash flood waters while conducting convoy operations June 2 on Fort Hood. Thomson added that as the community mourns the lives lost, “We also praise them for who they were, what they stood for and how they honorably served our nation. “They were many things to many people – sons and daughters, brothers and sisters, fathers and husbands, caring friends, trustworthy classmates and loyal comrades-in-arms,” he said. 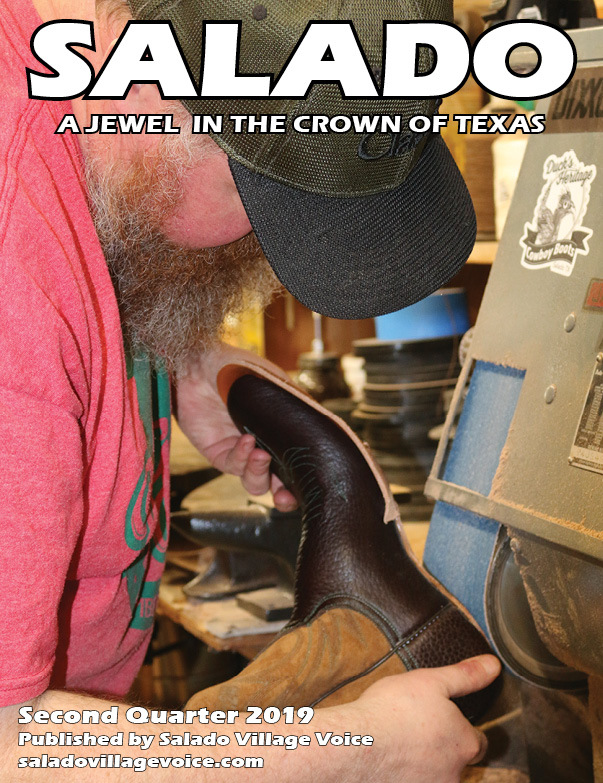 Central Texas and the Army Family across the nation came together in the wake of the flood to support those in mourning and remember the lives of each victim. The venue for the service has a capacity of 1,500, which was not large enough to seat all those hoping to attend. 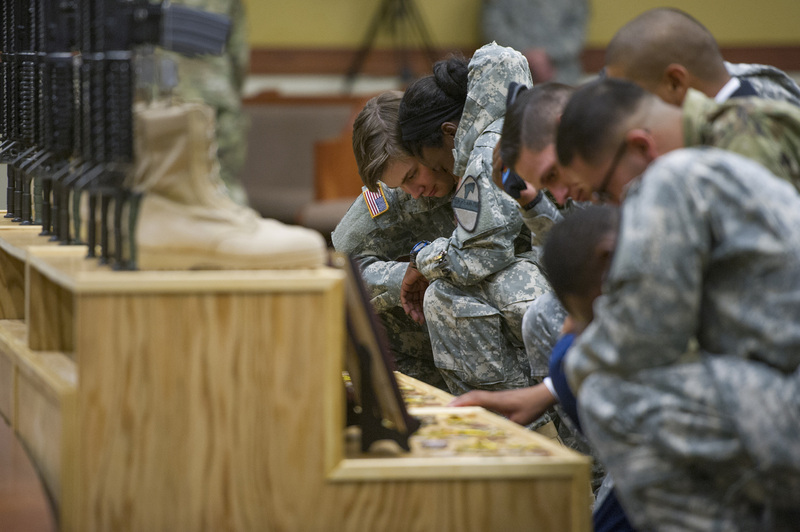 To reach out to hundreds more, the ceremony was live-streamed to Howze Theater, the Phantom Warrior Center and several conference rooms within the chapel itself. In addition to several thousand Fort Hood Soldiers, senior Army leaders also attended the event, including Secretary of the Army Eric Fanning, Army Chief of Staff Gen. Mark Milley and Sergeant Major of the Army Daniel Dailey. During the memorial ceremony, several Soldiers gave tributes to their fallen comrades, including Capt. Andrew Garland, company commander, Co. F, 3-16 FA Regt. ; 1st Lt. Johnnie Kaapuwai, Distribution Platoon leader, Co. F, 3-16 FA Regt. ; and Sgt. Jordan Singh, ammunition ammo noncommissioned officer-in-charge for the Distribution Platoon. 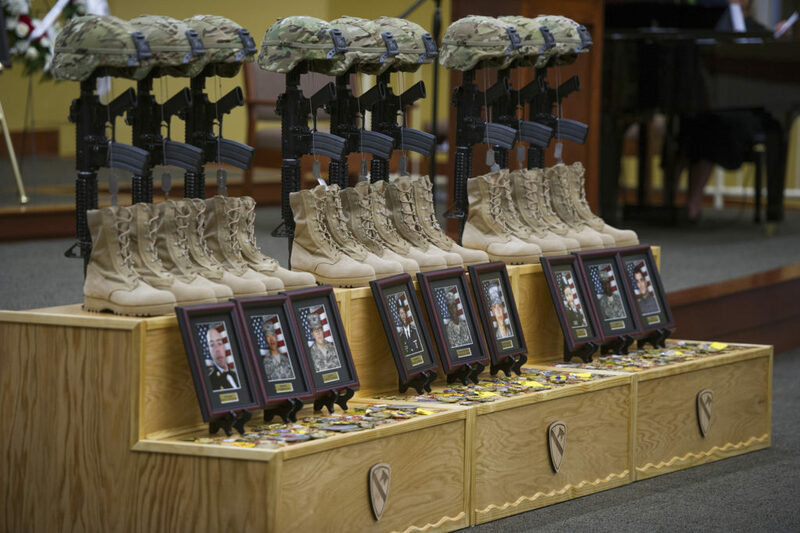 Garland began his Soldier’s tribute by announcing each of the fallen by name: Staff Sgt. Miguel Colonvazquez, Spc. Yingming Sun, Spc. Christine Armstrong, Spc. Brandon Banner, Pfc. Zachery Fuller, Pfc. Isaac DeLeon, Pvt. Eddy Gates, Pvt. Tysheena James and Cadet Mitchell Winey. “I have nothing but good memories of them,” Garland said of his Soldiers. 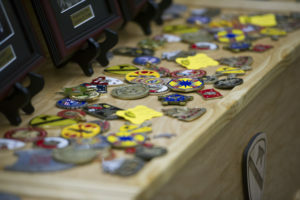 “These nine Soldiers shared the Army Values, but one value stood out among them – personal courage. Sun, Garland said, was known for having a light and warm personality that radiated throughout the platoon and company, someone who always had a smile on his face. Kaapuwai began with talking about James, a New Jersey-native with an accent Kaapuwai said the rest of them admired. Gates, Kaapuwai said, was unique from the very start. “She will always be remembered as being the helping hand to her battle buddies in need,” he said. As for Fuller, Kaapuwai said he was a proud Soldier who came from a rich military background. Winey, who was assigned to Co. F during West Point’s annual Cadet Troop Leadership Training, was described by Kaapuwai as being immediately ready to get his hands dirty. 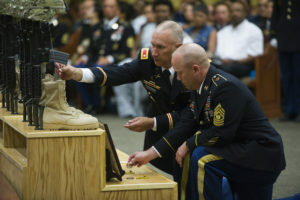 A separate memorial was held June 9, a week before this event allowing Winey’s cadet brothers-and sisters-in-arms, who were also attending Cadet Troop Leadership Training at Fort Hood, to be able to attend. The cadets departed here June 11 for New York. Singh took over for the remaining Soldier tributes beginning with Colonvazquez, saying he was the type of leader who always had a plan. “He was an NCO who was always on the move, and always ready to train and lead Soldiers,” Singh said. “He let us figure out our own solutions to our own problems, but was there for guidance. Moving on to Armstrong, Singh said she was one of the hardest-working people he knew, and the one person in the platoon they could all count on to lift spirits. DeLeon, Singh said, is someone who could not be easily forgotten. Singh said Banner was known by more than a few Soldiers as a very close battle buddy and a friend to many. After the benediction by Chaplain (Capt.) Anthony Turpin, 3-16 FA Regt. chaplain, a solemn final roll call was conducted, with nine names now missing an answer within the Rolling Thunder’s formation. A traditional 3-round volley was fired by a rifle team honoring the fallen. Taps followed shortly after, before hundreds of Family members and loved ones walked up to the nine Soldiers’ Crosses to quietly and privately pay their respects to the fallen warriors. 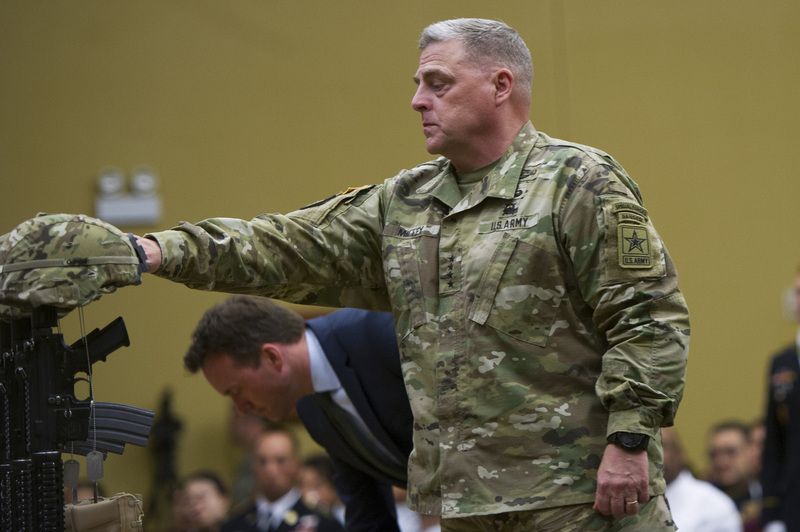 “All nine of these Soldiers had the fortitude and endurance to accept and conquer the challenges the Army gave them each and every day,” Garland said. “They never gave up.